Image caption John Kerry spoke of "the most promising opportunity for a political opening we have seen"
The US is intensifying diplomatic efforts to end the "hell" of Syria's civil war even as it increases support for moderate rebels, US Secretary of State John Kerry has said. 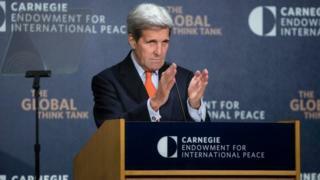 Mr Kerry is travelling to Vienna for talks with foreign ministers on ending the four-and-a-half year conflict. Iran is for the first time taking part in such talks, which will also include Russia, Saudi Arabia and Turkey. Russia and Iran both support Syrian President Bashar al-Assad. The US, Turkey, Saudi Arabia and other Gulf Arab nations insist he cannot play any long-term role in the country's future. Foreign ministers from the UK, France, Germany, Egypt, Lebanon and the EU have also confirmed they will attend the meeting, and other Middle Eastern powers are also expected. Iran's Quds newspaper sees Iran's invitation to the talks as US "acknowledgement of Iran's influential position in resolving the Syrian crisis". Saudi Arabia's Al-Jazirah warns of "more Iranian political and military expansion" should Mr Assad remain in power, leading to Tehran "[reshaping] everything for its own benefits". Lebanese daily Al-Nahar speculates that the US's "sudden decision" to invite Iran to the talks "reflects changes that occurred because of the Russian military intervention". Jordan's Al-Ra'i notes that Iran's inclusion "would be in support of Russian diplomacy", which was "standing alone" at previous talks. "The challenge that we face in Syria today is nothing less than to chart a course out of hell," Mr Kerry said in a speech at the Carnegie Endowment for International Peace think-tank in Washington DC. "While finding a way forward on Syria will not be easy... it is the most promising opportunity for a political opening we have seen." He added: "At the end of the day, nothing would do more to bolster the fight against Daesh [the Islamic State militant group] than a political transition that sidelines Assad so that we can unite more of the country against extremism." But in his speech, Mr Kerry stressed that the US and Russia also shared "common ground", arguing that both want "a united, secular Syria". Four years into Syria's civil war, and with Russia now conducting its own bombing campaign there separate from that of the US-led coalition, the conflict looks more dangerous than ever. But it's also created a new urgency to try to find a way out of the fighting. Some of the impetus comes from Russia, keen to be seen as a major player and anxious, apparently, to keep its air strikes limited. It's also due to a new readiness by the United States and Saudi Arabia to hear what Iran has to say - especially about the main point of disagreement: what role Syria's President Assad should be allowed to play in any transition. The Saudis and most Western powers see him as an obstacle. The Russians and Iranians argue he's a vital partner. The test of this Vienna meeting is whether there is any movement towards a compromise. But even without tangible progress, the very fact such a high-profile gathering is happening could mark an important step in the search for a way out of Syria's nightmare. Iran is believed to have spent billions of dollars over the past four years propping up President Assad's government, providing military advisers and subsidising weapons. However, Syria's political opposition has warned that Iran's involvement will only complicate the meeting in Vienna. Both Iran and Russia have recently stepped up their military role in the Syrian conflict. Iran has long acknowledged sending military advisers to Syria, but has denied the presence of any ground forces. Despite that, unconfirmed reports earlier this month said that hundreds of Iranian troops had arrived in Syria. They were reported to be joining government forces and fighters from the Lebanese Shia Islamist movement, Hezbollah, in assaults on rebel positions in northern and central Syria. Russia began its military intervention in Syria at the end of last month, launching air strikes in support of President Assad. Washington has accused Moscow of concentrating its air campaign there on moderate opposition groups rather than on the Islamic State militant group. Anti-government protests developed into a civil war that, four years on, has ground to a stalemate, with the Assad government, Islamic State, an array of Syrian rebels and Kurdish fighters all holding territory. Government forces concentrated in Damascus and the centre and west of Syria are fighting the jihadists of Islamic State and al-Nusra Front, as well as less numerous so-called "moderate" rebel groups, who are strongest in the north and east. These groups are also battling each other. More than 250,000 Syrians have been killed and a million injured. Some 11 million others have been forced from their homes, of whom four million have fled abroad - including growing numbers who are making the dangerous journey to Europe. Iran, Russia and Lebanon's Hezbollah movement are propping up the Alawite-led Assad government, while Turkey, Saudi Arabia and Qatar back the more moderate Sunni-dominated opposition, along with the US, UK and France. Hezbollah and Iran are believed to have troops and officers on the ground, while a Western-led coalition and Russia are carrying out air strikes.